I have very mixed feelings about this book, it had a very slow start, so slow I was noticing the grammatical errors rather than being involved in the narrative, and I felt that most of the conversations were stilted and overly formal and the overall premise was a little too contrived and convoluted. I was really miffed when on page 401 Joan says “…but why does Gloria kill Marisha months after Samuel.” At this point in the narrative Marisha is not dead, she is in hospital, in a coma, and she is certainly not dead as Joan states. 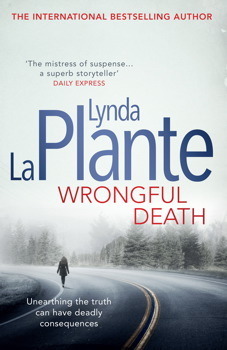 This sentence just needed the words try to, “why did Gloria try to kill…” I found these little editorial glitches very irritating – an obvious sign I was just not willing to suspend any disbelief and settle into the story. Despite my irritations with elements in this book I did read this in one sitting – I was keen to see how the narrative played out. I think if you do not examine this too closely this is a passable police procedural. Possibly this is a book for die hard fans of the author and this series. Passion – do you have it? How did you get it? How does it reveal itself? What are you passionate about? For may years I have been lamenting the fact that I honestly do not feel passionate about anything – well maybe anything except my immediate family (and maybe that is love not passion.) 🙂 At a dinner with a few colleagues – a millionaire now investing in making children’s lives better, a film maker, a director of an orphanage in Cambodia that she is patron of, I asked how/why they ended up doing what they do and why they do it. What I really wanted was the answer to my own question – what next for me? All these people had one thing in common – they have passion for what they are doing. Passion was the key. I felt like the odd one out. They all said, “Find the passion and you will know what road you want to travel.” Easier said than done. Recently I met several people who are passionate about the things they are doing; at a social event – a daughter’s birthday party held at a bowling club – I met an amazing passionate man – passionate about bowling! It was his duty at the club to explain the rules of the game to us and help us to enjoy the game and the facilities. He was so enthusiastic, so passionate when he talked about the game and his aspirations. It was a joy to listen and observe him. A few weeks ago we went to a local vineyard – The Growers, where we sampled some wines and were fortunate enough to be able to speak with the actual winemaker about his wines and his wine making experiences, processes. Here was another enthusiastic passionate individual. It was so obvious that he loved his work. Passion – what does it feel like to you? I really like a lot of things – reading, chocolate, wine, cake, trifle, ice cream, fishing, holidays…I used to enjoy my paid work… but passion… passion for any of those things? I don’t think so. What is it and how do I find it? From an NPR contributor and investigative journalist, a striking debut novel that chronicles the first twenty-four hours after a mass burglary in a suburban Chicago neighborhood and the suspicions, secrets, and prejudices that surface in its wake. Nestled on the edge of Chicago’s gritty west side, Oak Park is a suburb in flux. To the west, theaters and shops frame posh homes designed by Frank Lloyd Wright. To the east lies a neighborhood trying desperately to recover from urban decline. Although the community’s Diversity Assurance program has curbed the destructive racial housing practices that migrated from Chicago’s notorious west side over the past decades, cultural and racial integration has been tenuous at best. In the center of the community sits Ilios Lane, a pristine cul-de-sac dotted with quiet homes that bridge Oak Park’s extremes of wealth and poverty. On the first warm day in April, as Mary Elizabeth McPherson, a lifelong resident of Ilios Lane plays hooky from high school, a series of home invasions rock her neighborhood. A shocking act of violence and another of unexpected compassion in the wake of the burglaries leave the entire community indelibly altered, while the residents of Ilios Lane are thrust into an uneasy alliance and must take stock of the world they believed they lived in—and the world many of them were attempting to create. Snyder builds the story with subtle suspense, leading ultimately to an explosive conclusion. 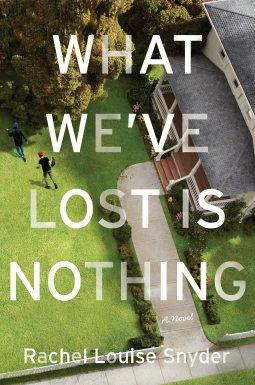 Incisive and panoramic, What We’ve Lost Is Nothing weaves together an impressive cast of characters, whose lives collide in the wake of disaster. In this powerful fiction debut, Rachel Louise Snyder sheds light on the gray area where idealism confronts reality. What a coincidence that I picked this book up to read the same week as my mother’s house was burgled. I have been mouthing the same sort of platitudes to her as were suggested in this novel…”it could have been worse, no one was hurt, “things” can be replaced.” What I didn’t focus on is what she had lost and could not get back, not yet anyway, the feeling of security, of being safe in her own home, of returning to her home at night without fear… and the dreams she lost…dreams of a future holiday (holiday savings taken, so that will not be happening, for a pensioner it is hard to recover from financial losses). I suppose I didn’t want to focus on the intangible, the things that I could not begin to fix, but maybe they should have been talked about. The victims of crime in this novel similarly try and avoid talking about their feelings whilst all the time doubts and suspicions niggle at their brain and undermine confidence. So here I am reading a novel about a community traumatised by a mass of burglaries in one street, and I am sympathetic; feeling all the complex emotions this incident evokes via the conduit that links me emotionally to my mother. I loved the way that the author uses this non violent crime to trigger and exploit a range of reactions in her characters and opens up a discussion on so many contemporary social issues; including the racism and the prejudices that are simmering just below the surface of good intent. It is a very interesting character study and an interesting situational expose that demonstrates that we are all looking for the same things in life; acceptance, friendship, tolerance and independence and a life lived without fear. This is a narrative that will open your eyes. A great read. If you like your crime fiction spiced with a paranormal flavour this book is for you. This fast-paced, supernatural thriller is a race against time to defeat a deadly force. Of Fever and Blood begins at the end of an investigation. Inspectors Vauvert and Svärta, an albino profiler, solve a series of sadistic ritual murders and the supposed culprits, the Salaville brothers, are killed in a standoff. However, one year later, the killings start all over again, but this time in Paris. All forensic evidence point to the brothers, but how can that be? Their investigation leads Svärta and Vauvert to Judith Saint-Clair, the deathly ill patient at a mental institution that also housed the Salavilles. They discover the incredible truth: Saint-Clair had manipulated the Salavilles into killing young women in order for her to accomplish magic rituals to stave off death. Nothing and no one will stop her from reaching her goal of eternal life . . . death is not an option. It took me a littler while to get into this book, to get an understanding of the protagonists and feel invested in this story, perhaps it was because I felt the introductory chapters were perhaps more about descriptions – about the settings, the history, the crimes, rather than about the characters and I like a good character based read. However the action quickly picked up the pace and I was intrigued with this paranormal/ crime/horror story. This was a complex narrative with plenty of plot twists, surprises and gore. This narrative is an interesting exploration of the secret and sometimes dark sides of our soul and asks the question – who/what do we see reflected in the mirror? This is certainly one for the paranormal fans. PS You must check out this video – this guy has such fantastic hair!! !